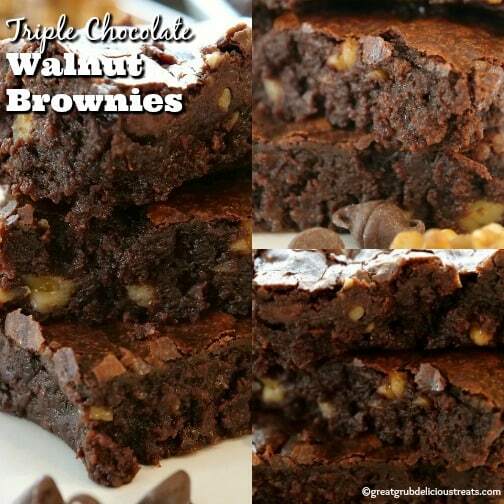 Here are some yummy Triple Chocolate Walnut Brownies that are totally scrumptious and will satisfy any chocolate craving. 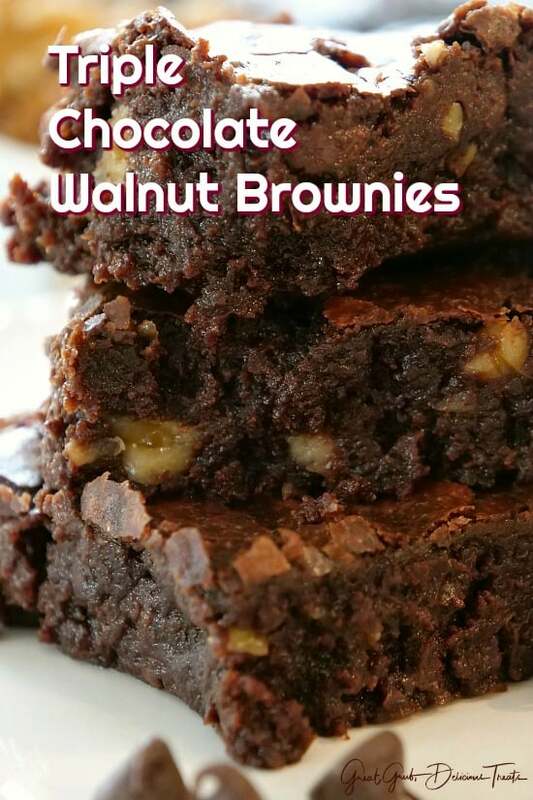 Making brownies are really easy and the end result tastes amazing and then to add walnuts into the mix… delish! 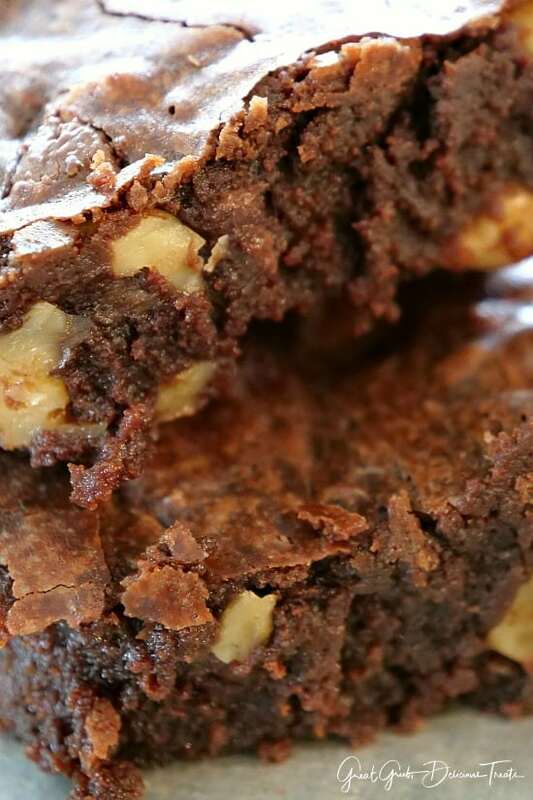 Brownies do not take long to make and making homemade brownies from scratch tastes so much better than from a box brownie mix. Look at these moist brownies. 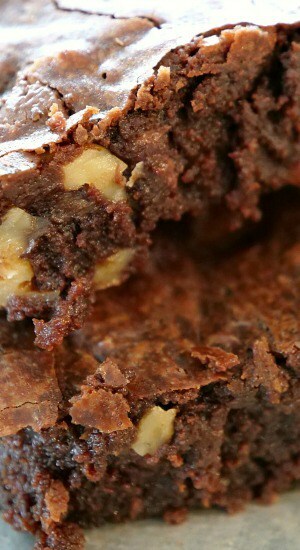 Seriously, so tasty and mouthwatering and one of the best homemade brownie recipes we’ve made. 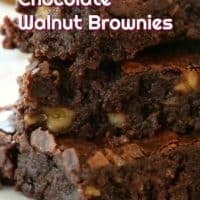 These triple chocolate walnut brownies are easy to make, they’re chewy, super moist and definitely delicious. 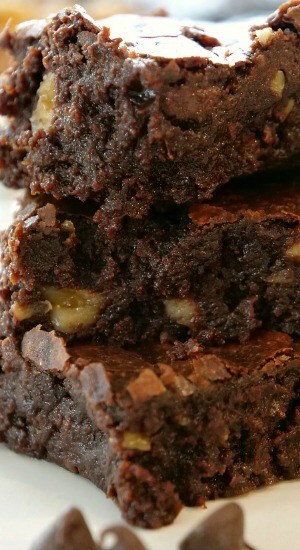 They are adapted from The Pioneer Woman’s Black and White Brownies. Start out with a medium saucepan. Add butter and chocolate chunks and cook over low flame until melted, then stir in the cocoa powder. Once everything has been combined together, remove from the flame and let cool for about 5 minutes. Next you’ll add sugar and vanilla. Next, stir eggs into the mixture, one at a time and then add the flour. Make sure only to stir until just combined. Pour the brownie mixture into a 9×13 baking dish that has been sprayed with a non stick spray. Pop in a 350° preheated oven and bake for 28 minutes. 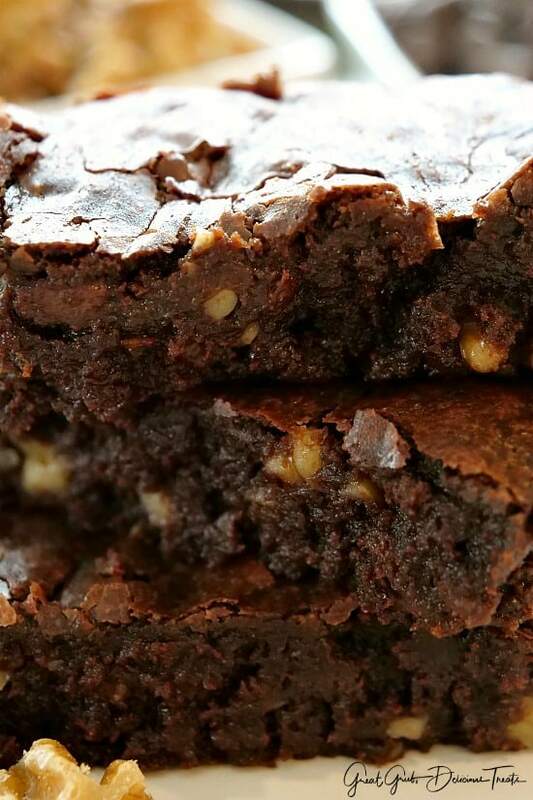 Make sure not to over bake these brownies. Underbaking is ideal that way when they are removed from the oven, then will continue to bake for a bit longer and the end result will be chewy, moist, homemade brownies. Here are a few more delicious dessert recipes that are on the blog: Chocolate Brownie Pudding Cake, Luscious Lemon Cheesecake, Chocolate Lover’s Zucchini Cake, Cream Cheese Lemonade Pie, Strawberry Lemonade Cream Cheese Poke Cake, plus many more. Preheat oven to 350° and butter a 9 x 13 baking dish, set aside. In a medium saucepan, melt butter and chocolate chunks. Once melted, add cocoa powder and stir. Remove from heat and let cool for 5 minutes. Next, add sugar and vanilla, stir. Add eggs, one at a time, into mixture and stir, then add flour and stir just until combined. Stir chocolate chips and walnuts into mixture and stir. Pour mixture into prepared baking dish, pop in the oven and bake for 28 minutes, give or take a minute or two. Remove from oven and let cool a bit. Cut into desired sizes and enjoy with a scoop of vanilla ice cream! Oh, these looks so good!! I will put these on my “to bake” list! Thank you! !